Settling in for hours in the air? Help mix things up for your kids by offering as many types of activities as cramped seating allows. 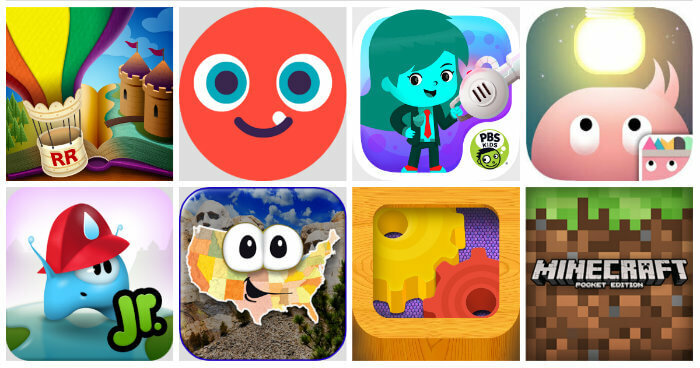 When books and I Spy run dry, these apps cover a wide variety of interests and ages to keep everyone happy and occupied. Play virtual board games, such as Monopoly and Scrabble, or create books with WriteReader Pro. In the mood to play alone? Have kids try The Robot Factory by Tinybop or Thinkrolls 2 to keep them interested — and thinking. Whether you’re playing as a family or your kid’s playing solo, you’re bound to find something for everyone from one airport to the next. Beach-trip travel prep with mini-games is fun at first. Free play in a virtual sustainable garden requires patience. Kids learn to write via practicing, mirroring, publishing. Capture blobs and problem-solve in fun, leveled games. Puzzler’s plot, unique gameplay will captivate young or old. Beauty of a board game set — for two or more players only. Faithful adaptation lets kids take classic game to go. Pass-and-play fun for families, friends; FB-play optional. ABOUT COMMON SENSE MEDIA: Common Sense Media is dedicated to improving the lives of kids and families by providing the trustworthy information, education, and independent voice they need to thrive in a world of media and technology. We exist because our kids are growing up in a culture that profoundly impacts their physical, social, and emotional well-being. We provide families with the advice and media reviews they need in order to make the best choices for their children. Through our education programs and policy efforts, Common Sense Media empowers parents, educators, and young people to become knowledgeable and responsible digital citizens. For more information, go to:www.commonsense.org.